Can Shaun Marcum save the season? FEAST MODE. That's how opposing teams have felt when facing Milwaukee righty Shaun Marcum lately. 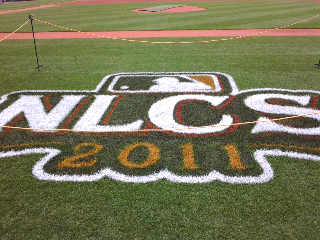 Now the Brew Crew turns to Marcum in a in a do-or-die Game 6 of the NLCS. In his past six starts, the Missouri native posted an 8.18 ERA and gave up some memorable homers to Paul Goldschmidt (a granny) and Albert Pujols. Today at Miller Park, reporters pressed Marcum for his thoughts about his struggles. They questioned his confidence. He didn't crack. "I feel great, actually. My arm feels good, body feels good. Just a matter of going out there, keeping the ball down, throwing strikes and trying to get ahead of these hitters," said Marcum, a former Blue Jays starter. "Being in the American League East, I was used to getting beat up every now and again ... Confidence is still as high as it's ever been. It's just a matter of going out there and making pitches and locating them and trying to get some outs." One more interesting note: Ryan Braun has 22 all-time hits in the postseason, tying him with Robin Yount for the club record. ST. LOUIS -- WEIRD, WACKY things happened at Busch Stadium for NLCS Games 3, 4 and 5. Towering fly balls down the line that were supposed to curl foul (hello, Matt Holliday) stayed fair. Milwaukee's running game was zapped to a halt, and its defense was atrocious in Game 5 as the Cardinals smoked the Brew Crew, 7-1, before a red sea of 46,904 fans. Edwin Jackson takes the ball for Game 6 in Milwaukee as the Cards go for their 18th National League pennant. Former New Hampshire Fisher Cats starter Shaun Marcum goes to the bump for Milwaukee. How about Marc Rzepczynski? The St. Louis reliever once again silenced Prince Fielder as the Brewers rallied in the eighth inning. Big Prince is has gone 0-for-4 with 4 Ks against Zep, who I caught up with at Busch. Matt Holliday went 3-for-5 and is batting .444 in the NLCS. "We kept getting runners out there and eventually break through," he said. Love the rally towels and T-shirts in St. Louis and the squirrel tails dangling from fans' hats. Might've even seen the Snorg T-shirt girl. ST. LOUIS -- They booed him. He beat them. Milwaukee outfielder Nyjer Morgan was back in the lineup for Game 4, and pesky "Tony Plush" had two hits and scored the go-ahead run in the fifth. Brew Crew wins, 4-2, behind Randy Wolf's seven strong innings at Busch Stadium. The best-of-seven series is knotted at 2-apiece, meaning the NLCS will return to Milwaukee. For once, the Cardinals didn't score in the first inning, but they did take a 2-0 lead, thanks in part to Matt Holliday's solo cheapie to RF in the second inning. Ryan Braun singled home T-Dot in the fifth -- and the Brew Crew was back in Beast Mode. Morgan was not available for comment after the game, saying, "No dice" to reporters. The Ax Man closed it out in the ninth, despite allowing a single by pinch-hitter Lance Berkman. Shaun Marcum on T-Plush: "He's a mess." 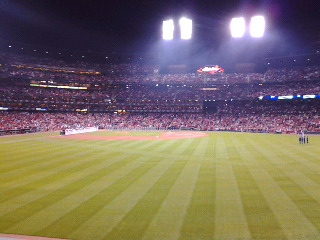 ST. LOUIS -- So now I'm funding my NLCS trip with gambling winnings from last night. Bumped into Brewers starter Yovani Gallardo at the craps table, and the 17-game winner won me 50 bucks by rolling a hard 10! "There’s nothing wrong with Toronto. This is just a great baseball city. Milwaukee and St. Louis treat baseball like Canadians treat hockey. It’s a lot of fun be out there every home game with 40,000 fans supporting you," said Marcum, scheduled to pitch a potential Game 6 on Sunday. We talked a lot about the Red Sox, a hot topic these days, and Marcum said there is nothing shocking about Boston starters watching team games from the clubhouse. But the beer? "Starting pitchers like to go inside, even when I was in Toronto. You can see pitches better when you’re watching it on TV. You can read the swings a lot better watching than you can in the dugout. Whether they’re drinking or not, I don’t know, That’s their choice." Marcum is under contract for one more year with the Brewers before reaching free agency. "I’d love to stay in Milwaukee. Whether I go to free agency or not, Milwaukee is where I want to be right now," he said. And, naturally, we needed a sound bite about Nyjer Morgan. “Oh, he’s a mess – in a good way. He’s a lot fun," Marcum said. " "He’s definitely misunderstood. Some people feel like they have to do that to have an edge. He's the kind of guy you definitely want on your team with the way he brings energy." IT'S A NATURAL. Really, the Red Sox had to stay in-house and hire Ben Cherington as the next general manager of the Boston Red Sox. This team, more than anything, needs stability right now, someone familiar with operations yet a strong, new voice with fresh ideas. That someone is Ben Cherington, a Lebanon (N.H.) High graduate and Plainfield native. CARDINALS ACE Chris Carpenter reflects on the great Albert Pujols, who has handled a contract season and distractions with class and professionalism. "I've been very fortunate to watch this guy play for the last nine years. When you're that type of player at that level, there are expectations from you, me, I'm sure his family, his kids and friends. I mean, the expectation level for what he's supposed to do is unbelievable ... Every year, you can't believe the things that he does, the games that he has, pressures that he deals with, the distractions coming into this season: a free agent, how much money is he going to get, best player in baseball, is he going to be here, is he not going to be here. But he comes in, just like the same old Albert, and works hard in spring training, starts off a little slow, everybody is questioning whether or not it's because of his contract situation. "No, he continues to grind, he continues to play, and continues to do the things that amazes every single one of us. That's who he is. He's an exceptional player, exceptional hitter. He's got the mind of stone. Nothing bothers him no matter what situation he's in. And that's what makes him great." CARDINALS ace Chris Carpenter, making his 12th postseason start, nailed down another win Wednesday night as the Redbirds took the upper-hand of the NLCS, winning Game 3 at Busch Stadium, 4-3. The Brewers, likewise, sent their ace to the mound, but Yovani Gallardo gave up all four runs. Carpenter passed Matt Morris for the most starts by a St. Louis pitcher in the postseason. He also picked up his 7th postseason win, tying the great Bob Gibson. "When people talk about you in the same sentence as Bob Gibson, it's pretty neat. And Bob Gibson, he's a Hall of Fame guy that's a super stud. I've done OK, but I'm not Bob Gibson," said Carpenter, who labored for five innings, allowing three runs on six hits. Just yesterday, Carpenter was saying how much he needs to enjoy the moment, referencing to the epic NLDS do-or-die matchup against Roy Halladay. "That's what's so fun about this game and pitching. You got out there, you have guys on the other side grinding out at-bats, pressuring you all night long. You have a few infield hits, a couple broken bats, and the next thing you know, you're in trouble every single inning. You never know." For the record, Gibson made nine postseason starts compared to Carpenter's dozen. Gibson went 7-2 (1.89 ERA) in the postseason, and now Carpenter stands at 7-2 (3.10 ERA). Current situation: A rocking Busch Stadium for Game 3 of the NLCS. New Hampshire native Chris Carpenter doesn't have his best stuff, but the guy is fierce like a grizzly mama protecting her cubs. Carpenter, a former home run hitter at Trinity High of Manchester, N.H., also singled in the fourth inning. 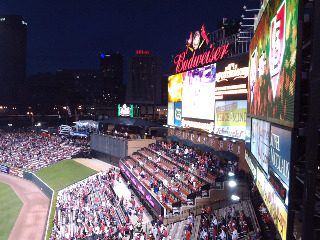 Cards hold a 4-3 lead. Hello, STL. This is my first trip to the Gateway to the West. 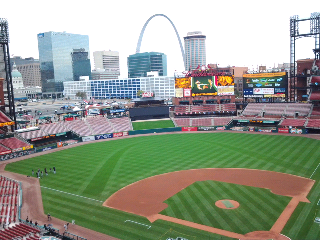 Had an amazing tour of the Arch, and now it's time for Game 3 of NLCS. No tarp on the field despite threat of rain. This ballpark is absolutely (gasp) breathtaking. Just spent the first inning behind the Cardinals dugout with some Carpenter fans. "Theo Epstein is my new GM"
Growing up in New Hampshire, Brad Zapenas went to as many Red Sox games as possible and always dreamed about playing at Fenway Park. Today the goal is to sign a contract with Theo Epstein and play at another of baseball's cathedrals, Wrigley Field. Zapenas, drafted by the Cubs this summer, awoke Wednesday morning to learn Epstein was leaving Boston and taking on the ultimate challenge of leading the Cubbies to the World Series. "I was excited. He's been a familiar face throughout college," said Zapenas, who played for Boston College. "I had the chance of meeting him when we played at spring training. He's young, and it's a great opportunity for him to come to the Cubs and help us win a World Series just like he did in Boston, which would be an unbelievable accomplishment for him, as well as for the Cubs." The Cubs, honestly, were his second choice for a career move. "In high school, I always wanted to go to the Red Sox, but I thought the Cubs would be a coll team since they haven't won a World Series in so long, and I feel like everyone in the baseball world is just hoping it will happen soon since they are such a storied franchise," said the Cubs farmhand, an infielder. "It would be special to be part of this organization when they do win a World Series, and I think bringing Theo in as GM means they are really looking to be successful in the years to come." Theo Epstein, the kid who ended the 86-year curse in Boston is heading to Chicago. Epstein already has agreed to a five-year deal with the Cubs believed to be about $15 million. The deal is expected to be finalized by the end of this week, once negotiations for compensation with the Red Sox have been finalized, according to WEEI's John Dennis. Can't say I'm surprised. It's a great opportunity for Theo, who takes on the ultimate challenge of bring a World Series champion to the Cubs. You can bet Epstein's successor will be New Hampshire native Ben Cherington, who played high school ball at Lebanon (N.H) against my Plymouth Bobcats. Remember, it was Cherington who took over as co-GM along with Plymouth, N.H., native Jed Hoyer for a brief stint in 2005. Cherington and Hoyer pulled off the trade for Josh Beckett and Mike Lowell. Here's a look at Cherington as the right man for the job, an extensive piece written by Alex Speier. ST. LOUIS -- The latest verbal arrow in the Brewers-Cardinals rivalry was fired by Zack Greinke, who basically called Chris Carpenter a phony. "I think his presence, his attitude out there sometimes is like a phony attitude. And then he yells at people. He just stares people down and stuff," Greinke said. "A lot of our guys don't like Carpenter." Carpenter, who's already gone back and forth with "Tony Plush" on this topic, offered a response to Greinke during Tuesday's NLCS Workout Day at Busch Stadium. "Why Zack thinks there’s a problem, I’m not sure," Carpenter said. The most telling moment of the interview session came when Carpenter, a Trinity High of Manchester graduate, wouldn't take the Brewers' bait. "I know what they're saying. They can do what they want, they can say what they want. I don't care. I'm not concerning myself with that. It's called playing the game the right way. It's called being professional." Yowzers, this is getting good. When the New Hampshire native last pitched against the Brewers, Carpenter struck out Nyjer Morgan in the ninth and said some things. This prompted Morgan to chuck his wad of chewing tobacco in the pitcher's direction. Said Morgan, "He felt like he had to say something. But as soon as he said it, he turns his back and runs away." During postgame, Carpenter tried to avoid the issue but couldn't hold back when asked about the Brewers' agitator:"He was yelling at me at second base. The whole game he's screaming and yelling at me. I don't know if he's trying to get guys out of their game, but I'm not going to allow it to bother me. He's a serious talent. He just plays the game in a different way," Carpenter said. "There's a certain way to compete. There's a certain way not to compete. It's unfortunate because it takes away from how good a player he is." Get ready to drop the gloves for Game 3. The teams are even fighting over the family seating at Busch Stadium as Amy K. Nelson reports. On the air with Lobie and "Jackie Boy"
TUNE INTO 107.7 FM "The Pulse" at 4:05 p.m. today as I join Jack Heath on "New Hampshire Today" to discuss the NLCS and New Hampshire native Chris Carpenter. Earlier today, I was on the air with Bob Lobel and talking Scrabble, cell phones, and, yes some ALCS. Despite what Jack Heath says, I didn't spend my spring training trip floating around the pool with a laptop. LOL. Here is a picture from a Blue Jays-Pirates game. I commandeered a golf cart and took a break while waiting for an interview with Jeff Locke. NELSON CRUZ sent baseball historians scrambling with his walk-off grand slam in the 11th inning to beat Detroit, 7-3, in Game 2 of the ALCS on Monday. Walk-off granny in the postseason? Never been done before. As a sports writer for the New Hampshire Union Leader, I've been able to cover two of the most memorable walk-offs in baseball history. 1. ), Aaron Boone, Oct. 16, 2003 -- I sat in the right-field auxiliary press box (among the crowd) to watch the majestic blast off knuckleballer Tim Wakefield. Unbelievable. The Red Sox somehow found a way to blow a 5-2 in the eighth inning and lost in the 11th. I swear the upper deck at Yankee Stadium was shaking and beer rained down, glistening in the lights. 2. ), Big Papi, Oct. 18, 2004 -- A night after beating the Yankees with a walk-off homer in the 12th, David Ortiz beat the Evil Empire with a single in the 14th. The Red Sox went on capture the ALCS and win the 2004 World Series. My son pretends to be "Tony Plush"
Who could forget the last time Nyjer Morgan faced Chris Carpenter? "Tony Plush" struck out in the ninth inning and incited a bench-clearing mini-brawl after tossing his wad of chew at Carpenter. They meet again in Game 3 of the NLCS at Busch Stadium on Wednesday night. I'll be there!